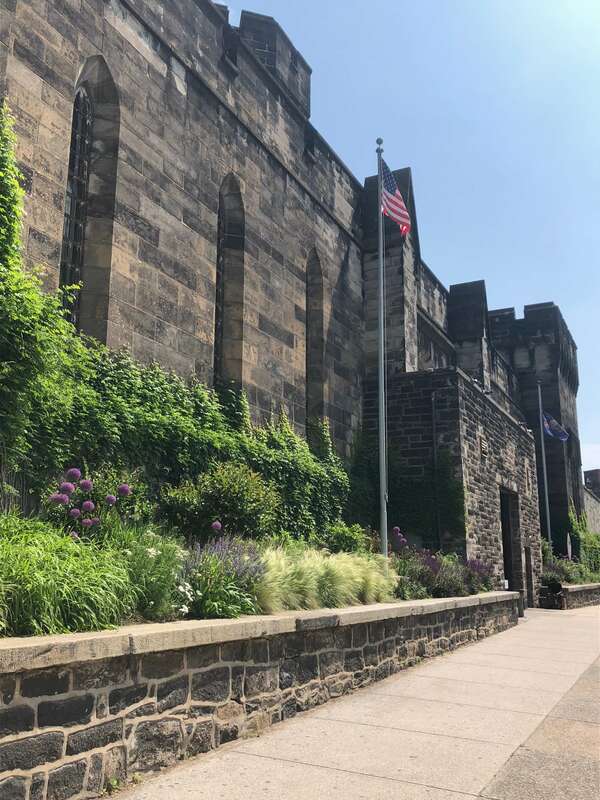 One of our first adventures in Philly with kids was a trip to the Eastern State Penitentiary, a former prison that was once the most expensive in the country that’s now in ruins. Upon arrival we received a headset and a video recording for our self-guided tour where we walked throughout this tower-like space, looking into cell blocks and learning about the people who were once incarnated. 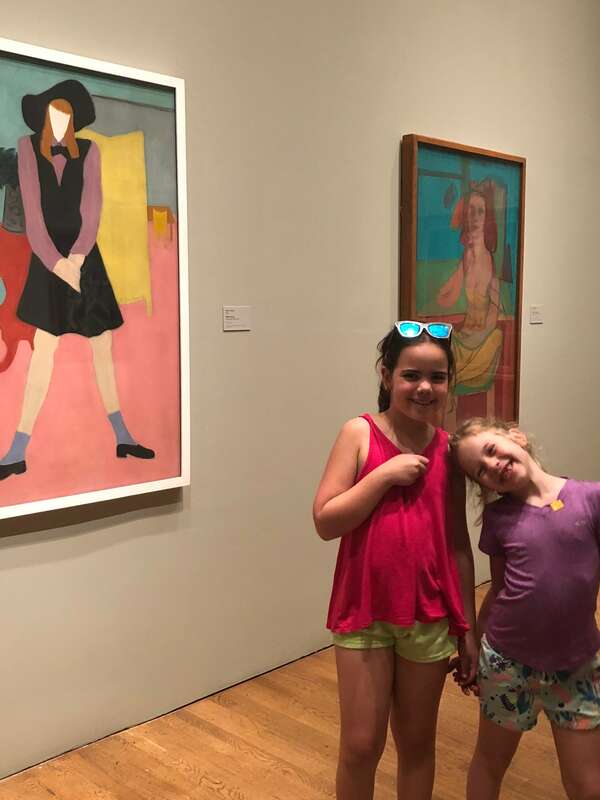 My older kids (10 and 7) followed along as they were surprised to see some of the crumbling rooms as they learned more about its complicated history. 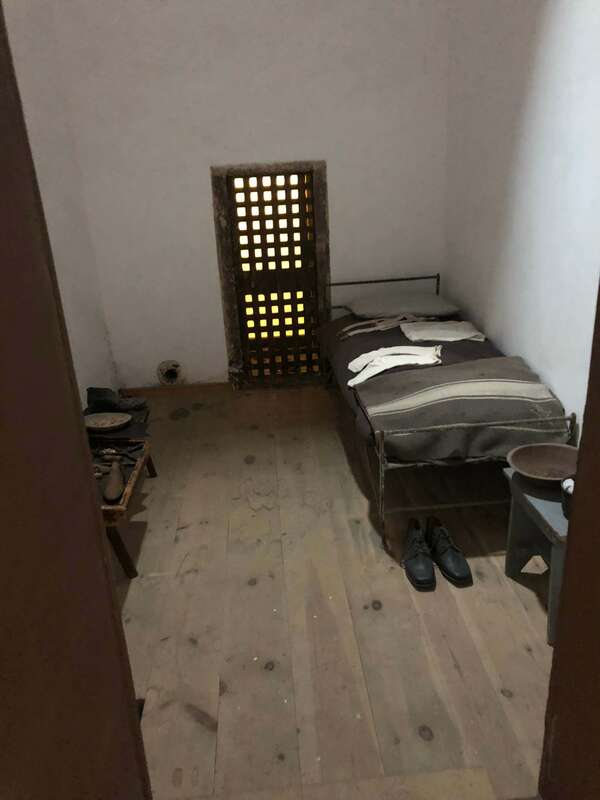 Through our visit, we had the chance to see the hospital, punishment cells, and even a look into Al Capone’s Cell, which, was surprisingly decked out with rugs, furniture, and fine art. We also visited the ‘Prisons Today’ area, an educational exhibit that broke down the complexities of the prison system. 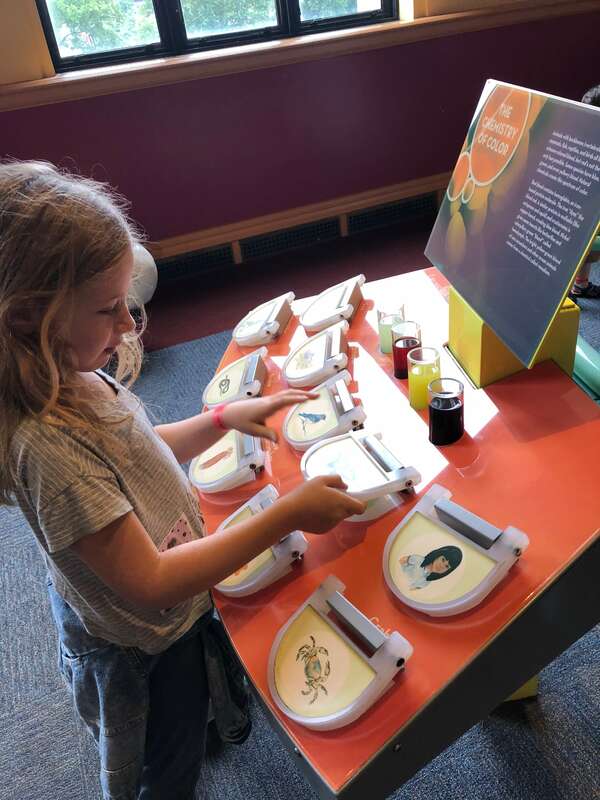 My kids were super engaged as they interacted and participated in this interactive exhibit, which included letters from inmates and guests where we had to guess which letters were from people who were actually in jail. 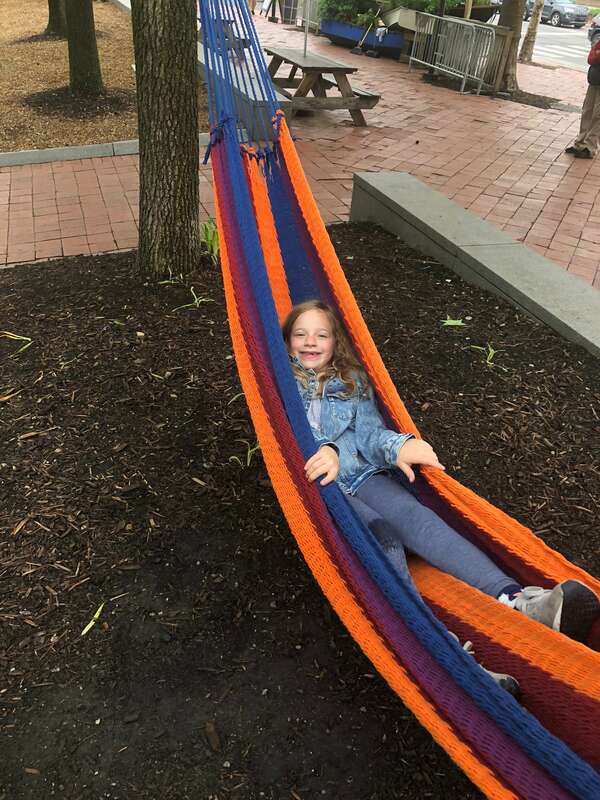 There was also an exhibit about the cost of the prison system, prison reform today and a video, discussing the complexities of incarceration on families. 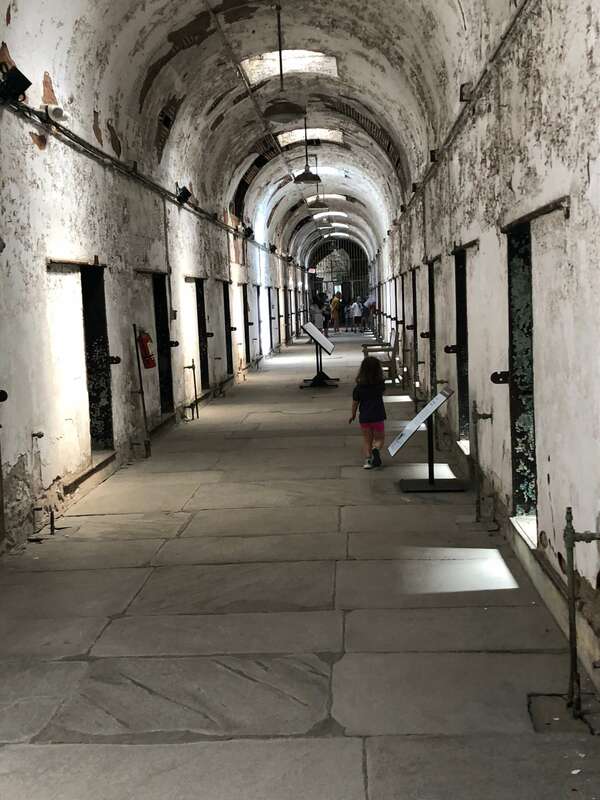 An educational and eye-opening experience, our visit to the Eastern State Penitentiary brought to light so many new layers of the prison system (from the past and today) that myself and the kids knew little about. 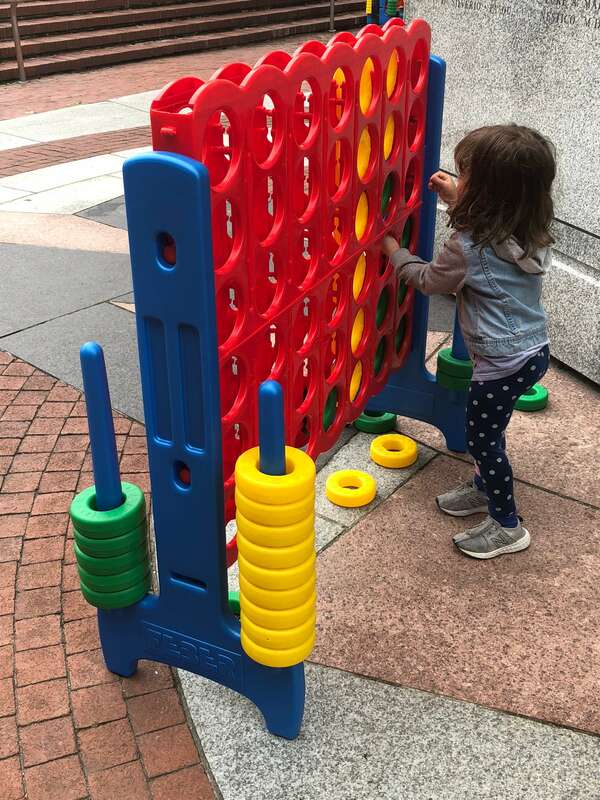 Of course our three-year-old was there as well but had to sign a waiver due to the crumbling paint and unsafe conditions. 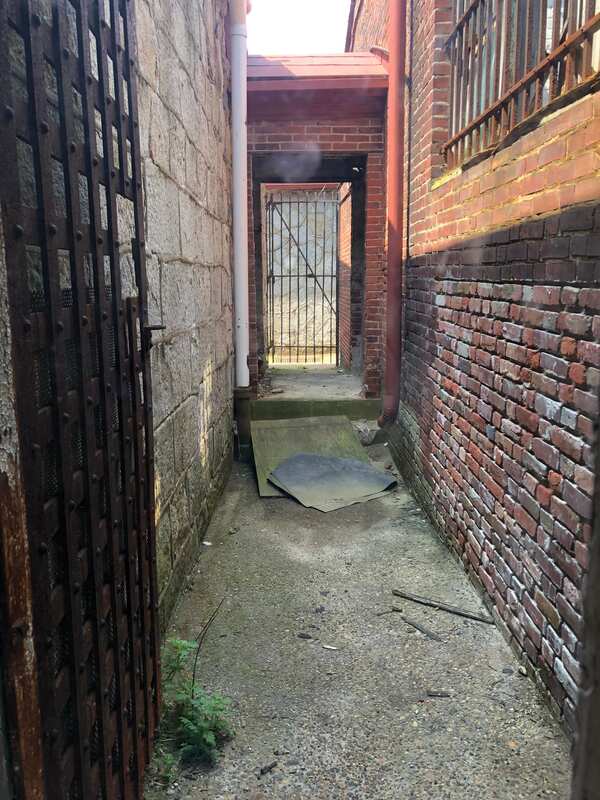 They recommend this visit for kids seven and up and after my spirited toddler snuck into old cells and run wild throughout the space, I can definitely see why it isn’t the best place for that age group. 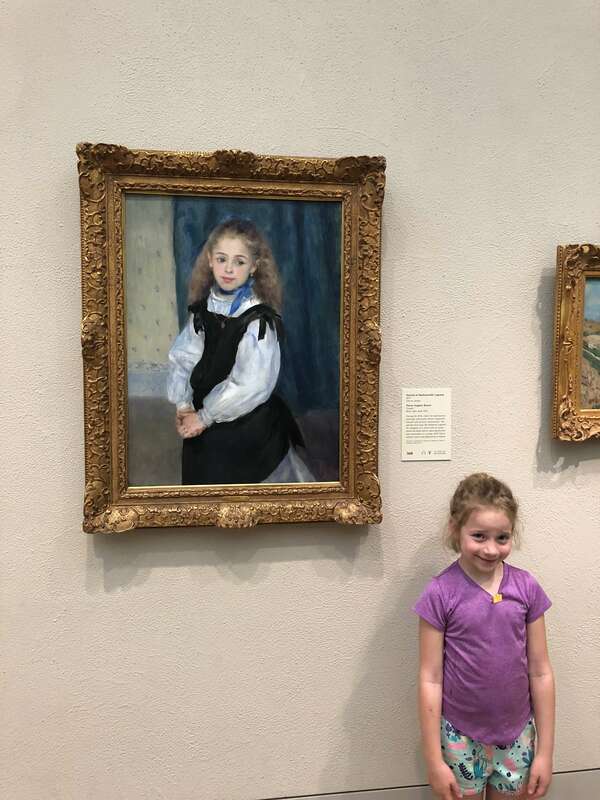 Another experience during our trip was a visit to the Philadelphia Museum of Art. 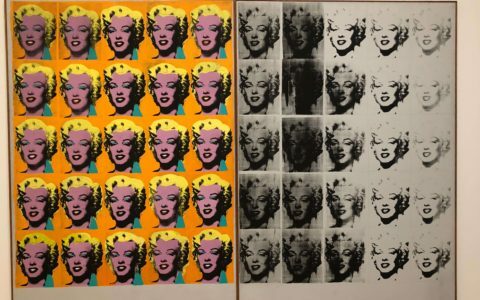 We spent most of our time checking out the Modern Times Exhibit, which included a collection of art from 1910-1950. 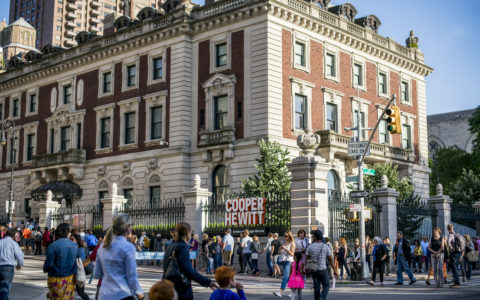 This included the chance to view works by Georgia O’Keeffe, Marsden Hartley, Jacob Lawrence, Edward Hopper and more. 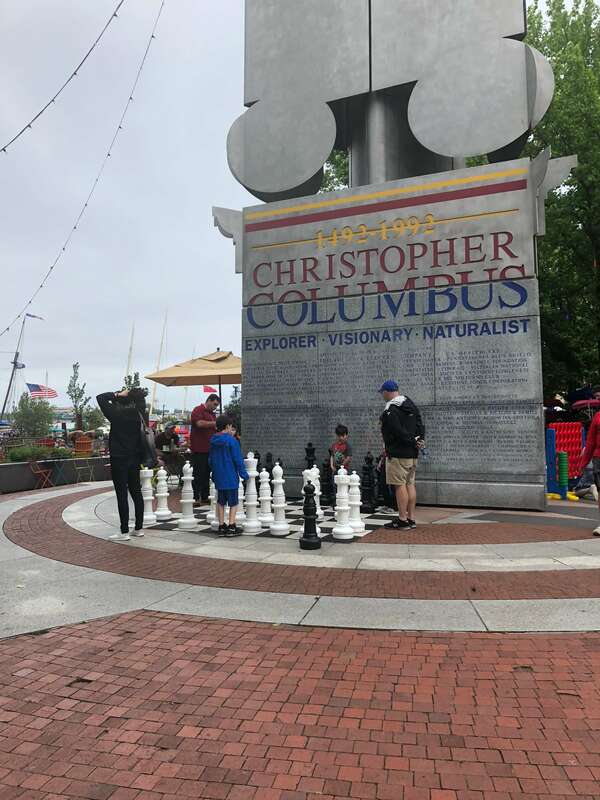 They also offer daily tours and programs throughout the day as a way to learn more about the museum and its incredible offerings, such as an architecture tour of the museum or a group tour of the Modern Times Exhibit, among other cool programs to check out. We also enjoyed viewing the massive arms and armor exhibit, which included equestrian equipment, helmets, weapons and more. 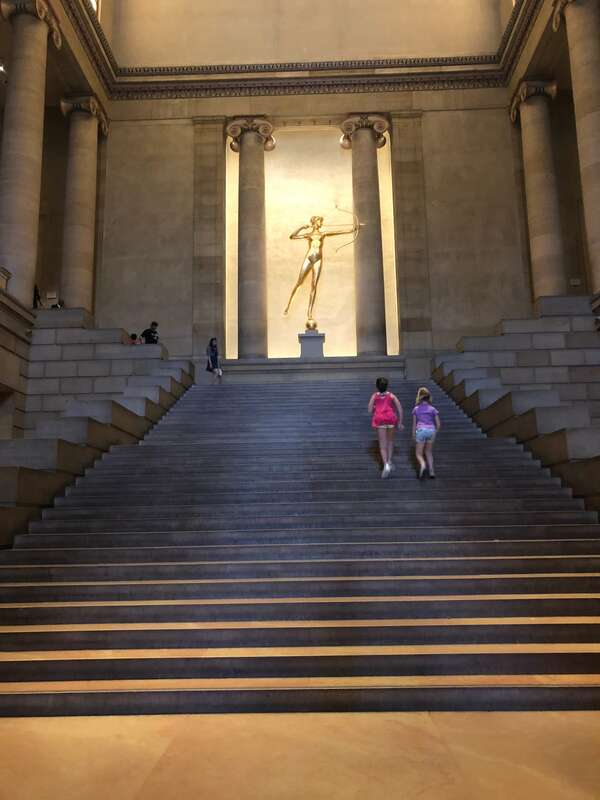 The outside of the museum is also an experience in itself where we saw multiple wedding pictures on the stairs, people taking pictures with the Rocky statue and people running up the classic stairs to capture that moment. 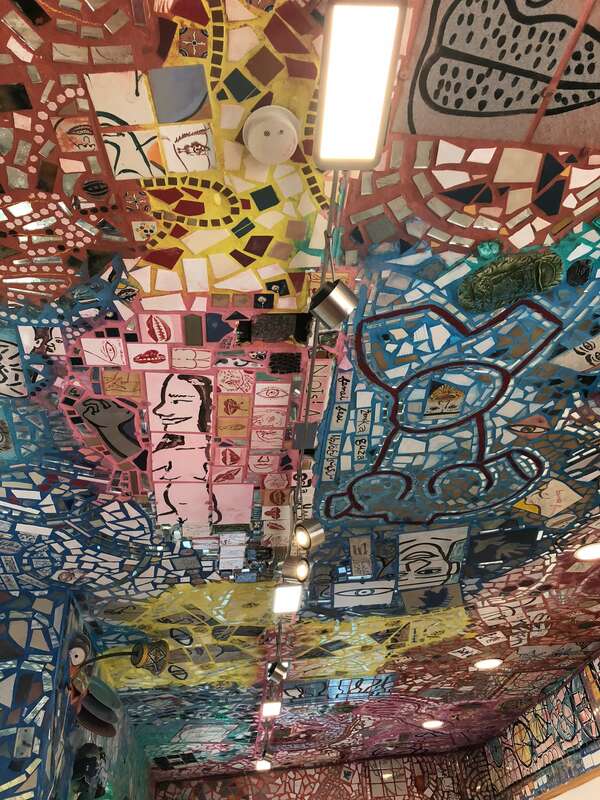 A magical part of our trip (just like its name) was a visit to Philadelphia’s Magic Gardens. 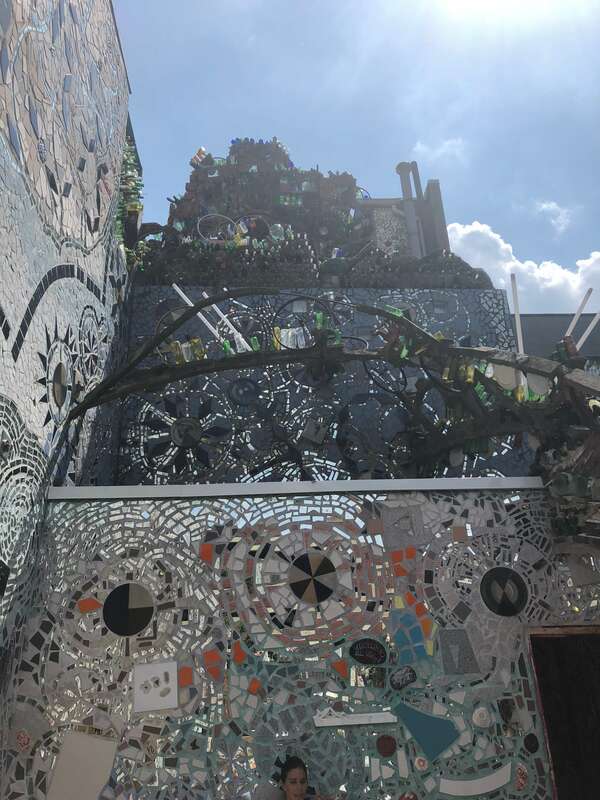 A non-profit public art concept, the installation features a mural of made of nontraditional materials like statues, found objects, bicycle wheels, colorful glass bottles, hand-made tiles, and mirrors. 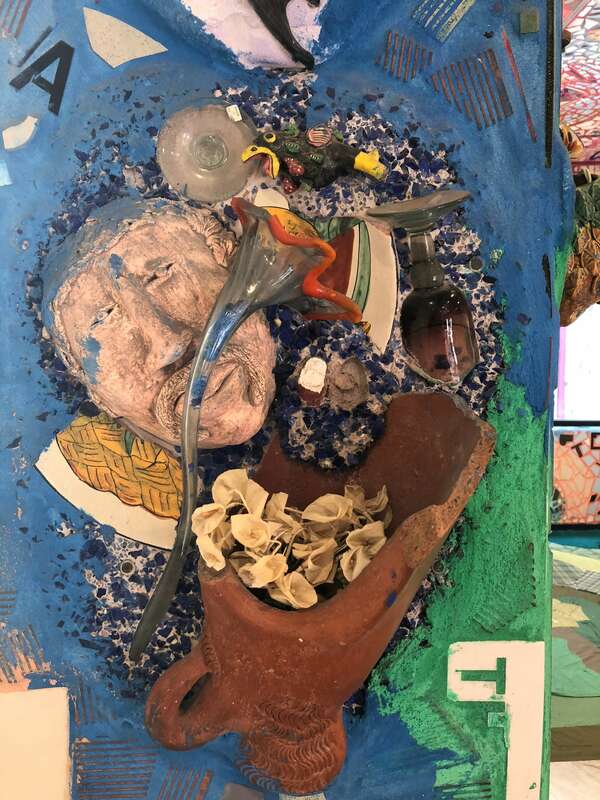 The result is a spectacular and inspirational display of art, showcasing inventive and nontraditional ways to use materials and objects. 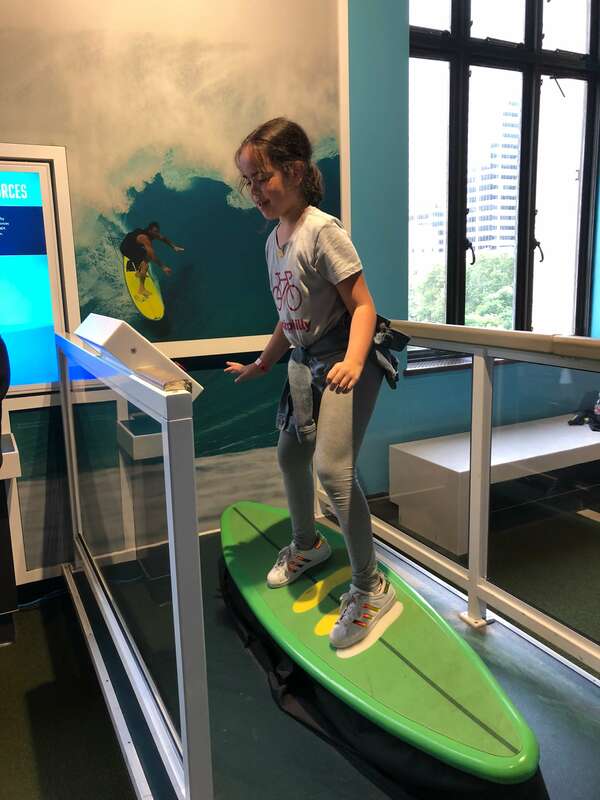 The kids were sheet for a scavenger hunt where they had to locate various objects located around the space. 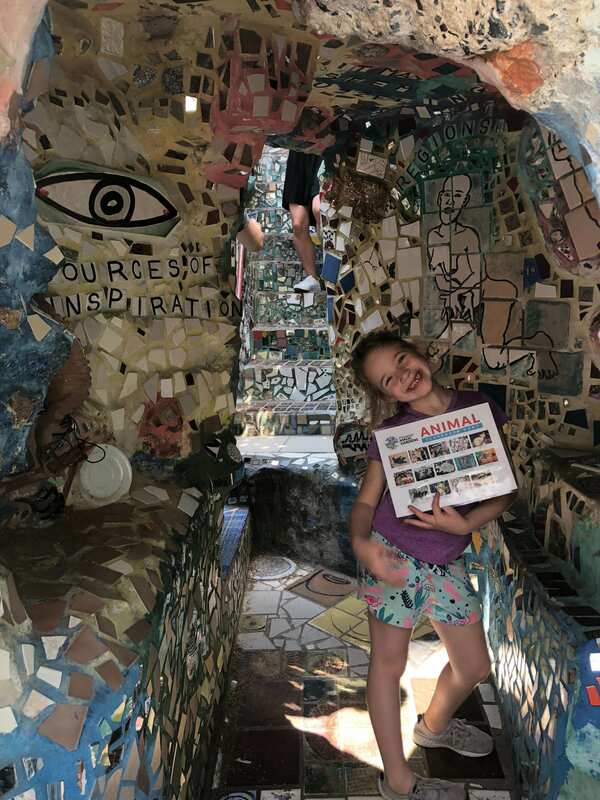 They loved looking through the mosaics trying to locate the list of animals as they had a close-up at this wonderful exhibit. 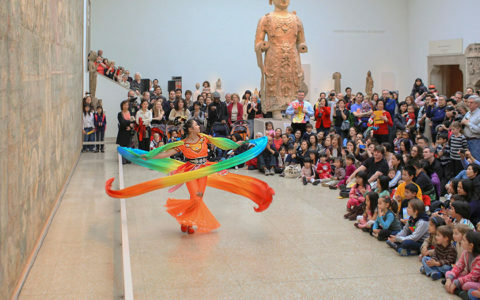 They also offer tons of public programs, such as family jams, workshops, garden and crafts nights. Be sure to get your tickets early, they often sell out! 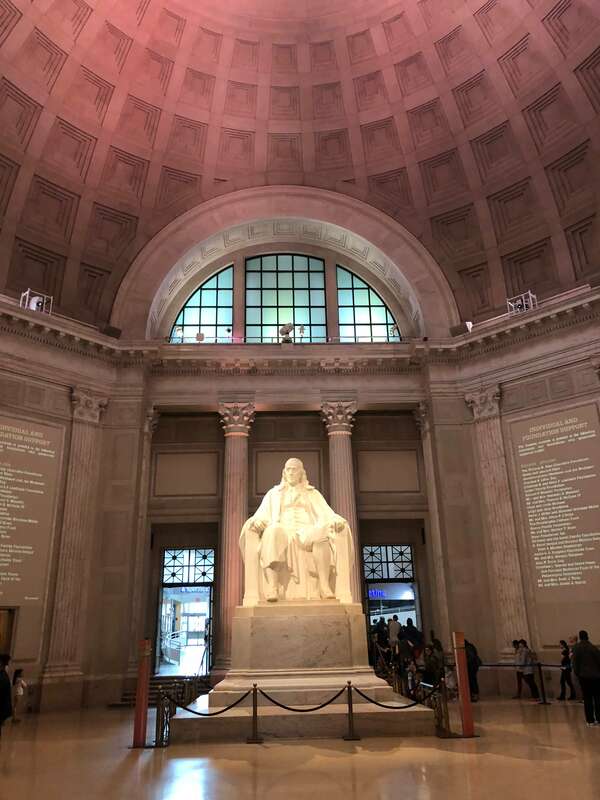 For some scientific discoveries, we went to The Franklin Institute. 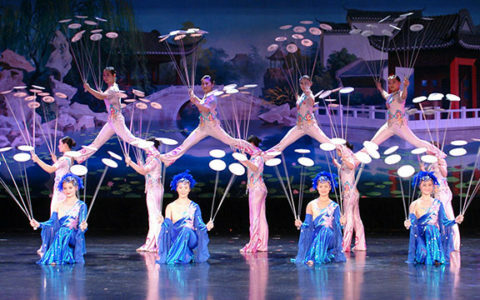 The exhibits were located on three floors where we visited Electricity, the Giant Heart and the SportsZone exhibits. 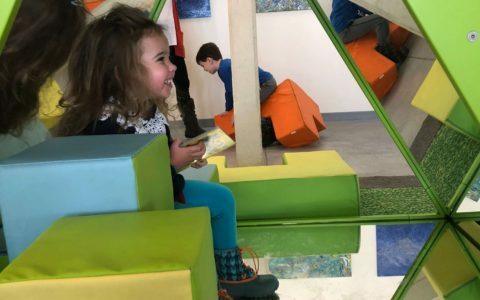 The kids loved the Giant Heart area where they had the opportunity to learn more about how the heart works in this 5,000-square-foot exhibit. 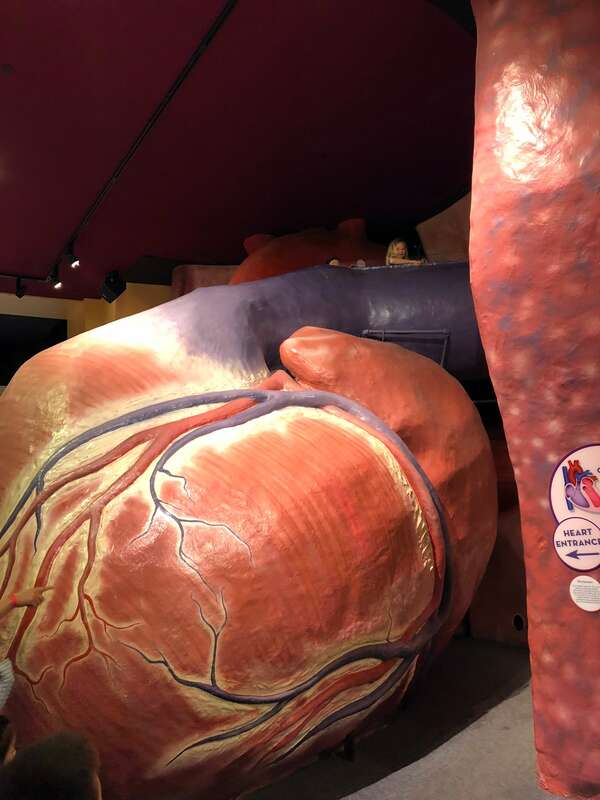 Some of their favorite parts were having the chance to climb the giant heart and climb through the artery. 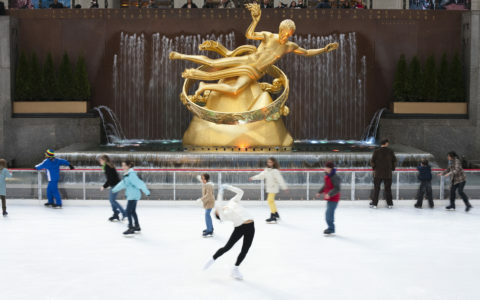 It was also cool (and pretty gross!) to see the surgical suite, which showed a video of how a surgeon performs open heart surgery. 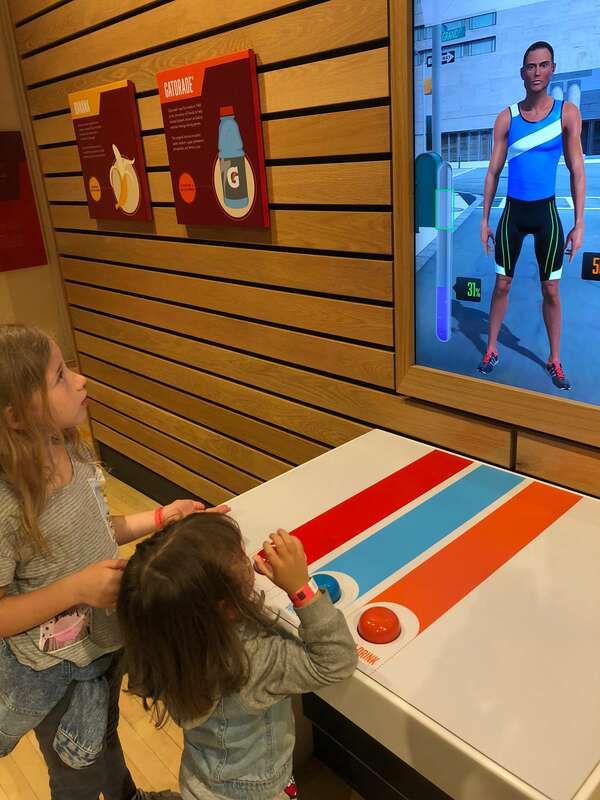 They also loved the SportsZone area that featured interactive exhibits where kids could learn more about various sports and the importance of fitness. 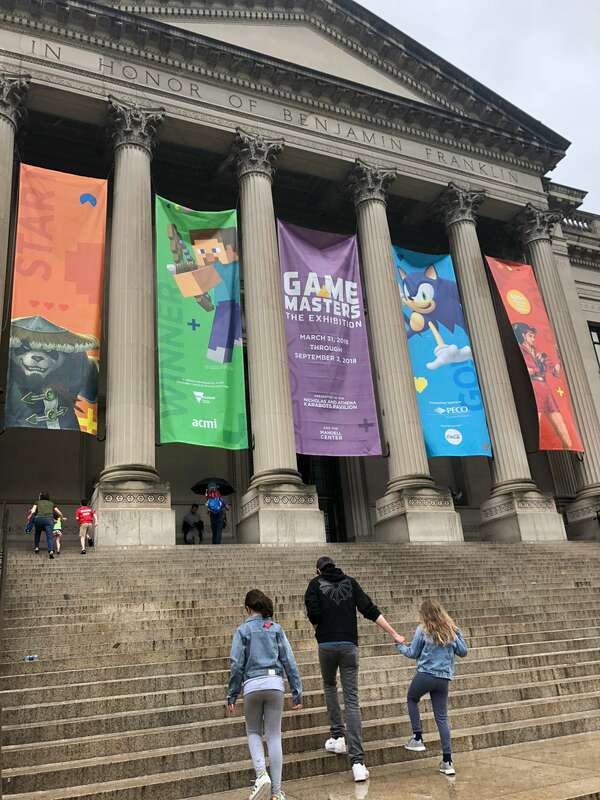 There was also a special GameMasters exhibit (available for an additional fee) but we didn’t have the time to explore this area. It sounds really cool for the game lover, though where they can have the chance to play 100+ video games, check out original art work and interviews to learn more about the creators of some famous games. 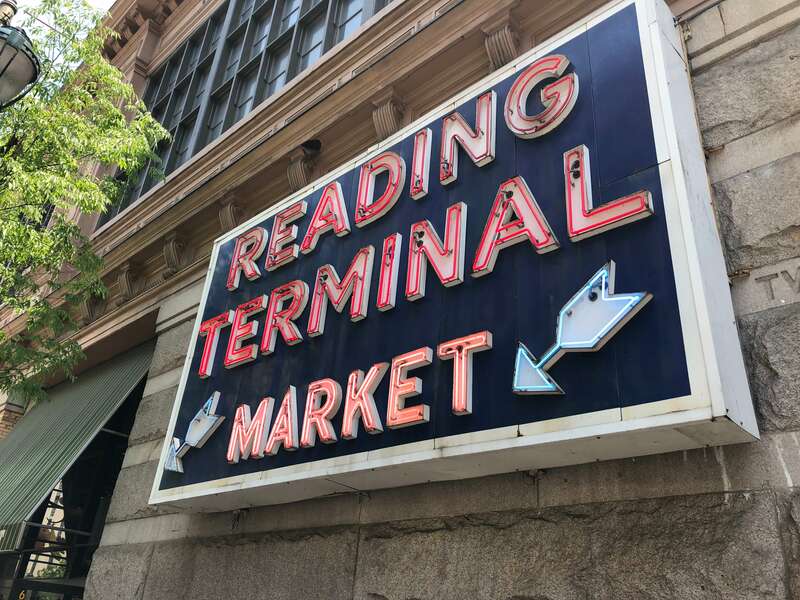 And of course food was involved during our trip and a must check out experience is a visit to the Reading Terminal Market. However, be prepared to be overwhelmed! The second we walked in the space, there were food merchants everywhere selling everything you could possibly imagine. 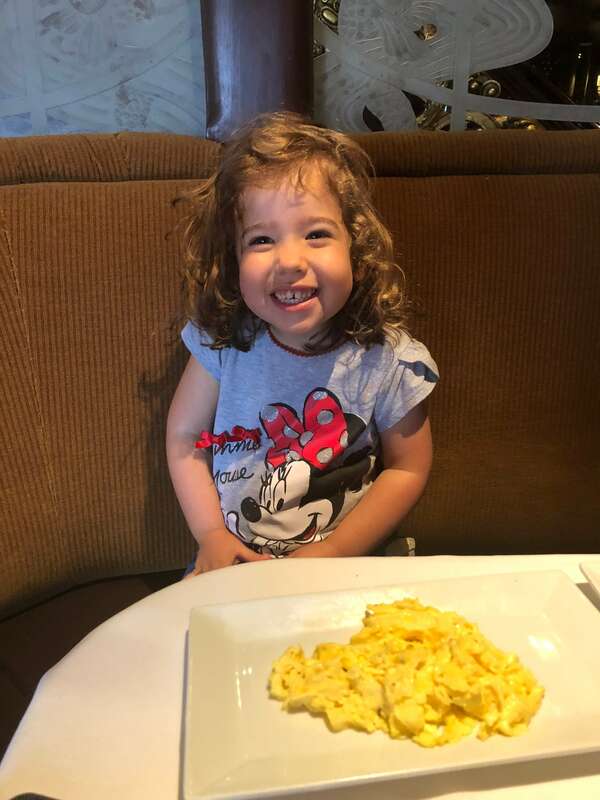 From pizza to seafood to burgers to fruits and veggies (and so much more!) that has been serving people since 1893. When we entered into the space, we were given a map of where all of the vendors and decided to walk around to soak it all in. We decided on pizza for the girls and I had Indian. Finding a seat was another challenge where we had to walk through the seating area a few times before another party had finished eating, but it was all part of the experience and something to keep in mind when you visit this massive market. 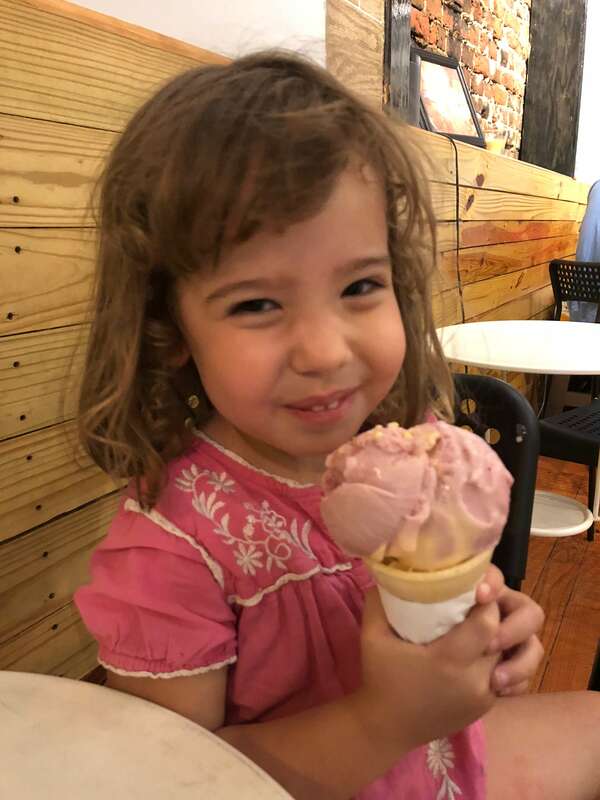 After our meal, we stopped at Bassetts Ice Cream for some delicious treats. 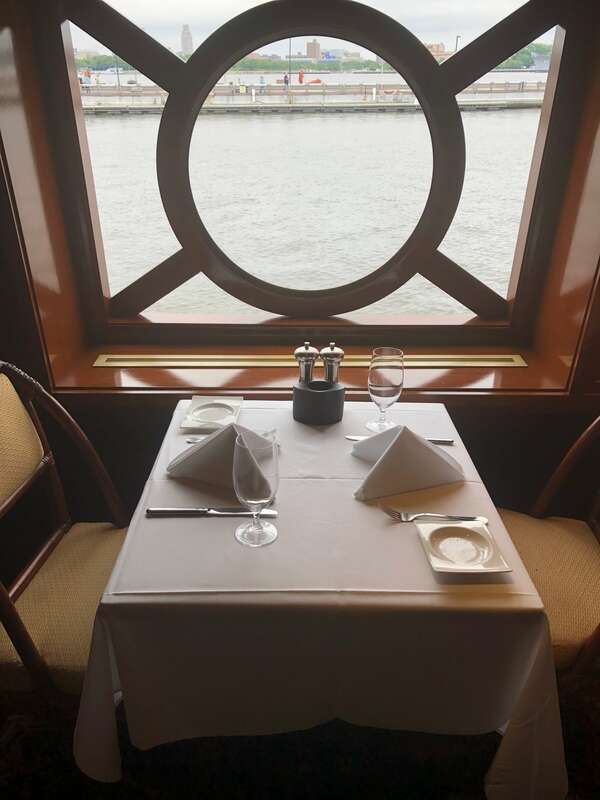 Brunch on a boat? Yes, please! 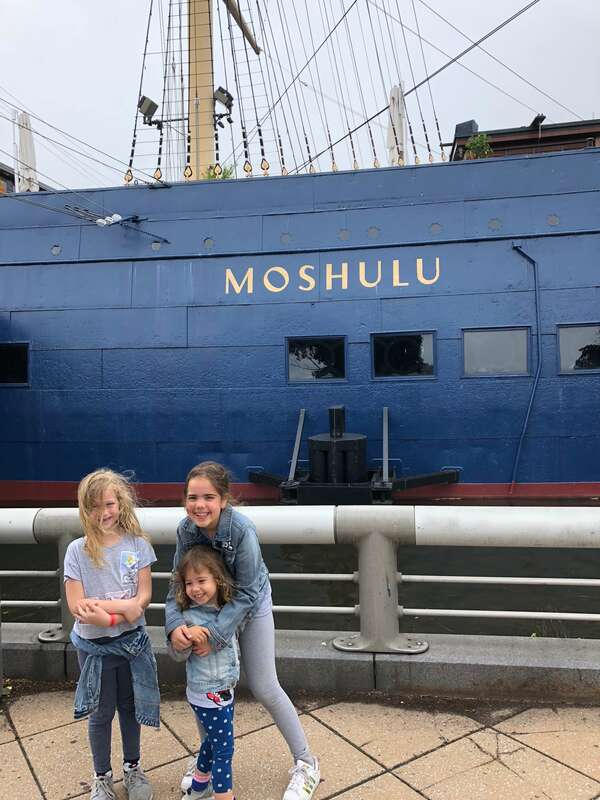 Another favorite food experience we had was a brunch at Moshulu, a fine dining boat restaurant that features American fare. 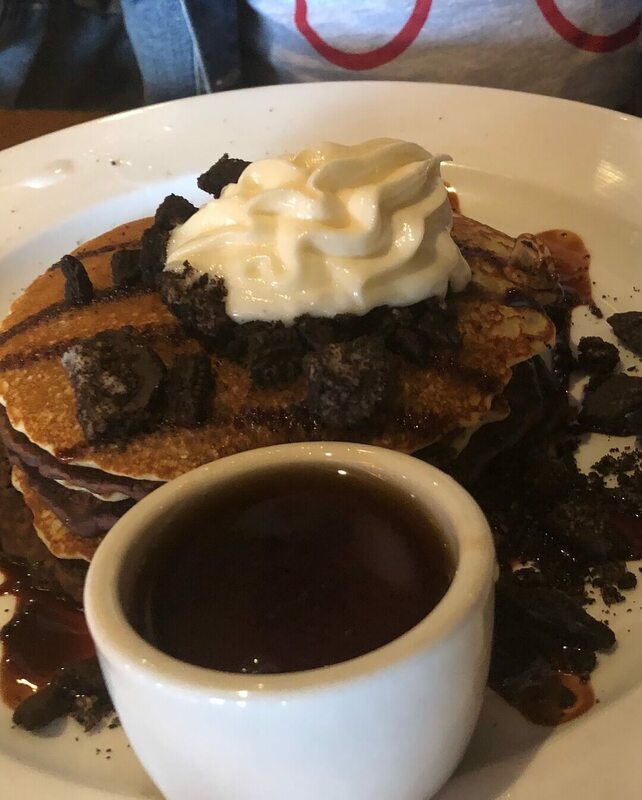 For brunch, the girls had Oreo Pancakes. This incredible treat was covered in chocolate drizzle and maple syrup that they happily devoured. My husband had the Chocolate Babka French Toast and I opted for a healthy brunch with the Boat Salad. This hearty salad included tomato, cucumber, avocado, pepper and feta that was dressed with a yummy Balsamic Vinaigrette. Moshulu is also open for dinner, lunch and drinks, which I would imagine would be a fun spot to enjoy a cocktail this summer. 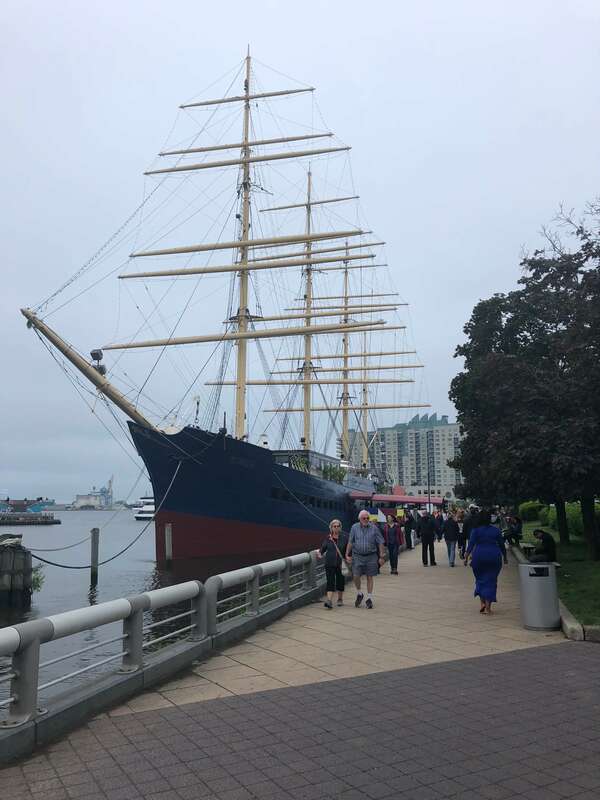 After brunch, we took a walk along Penn’s Landing and stumbled upon Christopher Columbus Park/Spruce Street Harbor Park. 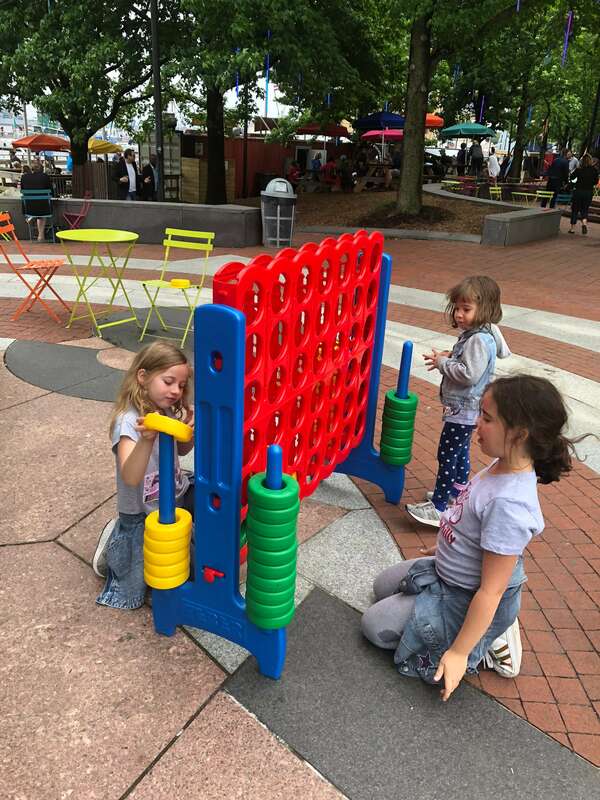 This public space isn’t your typical playground but included colorful hammocks, access to the nearby Boardwalk and giant games of Connect 4, chess, and bricks at the Christopher Columbus Park. 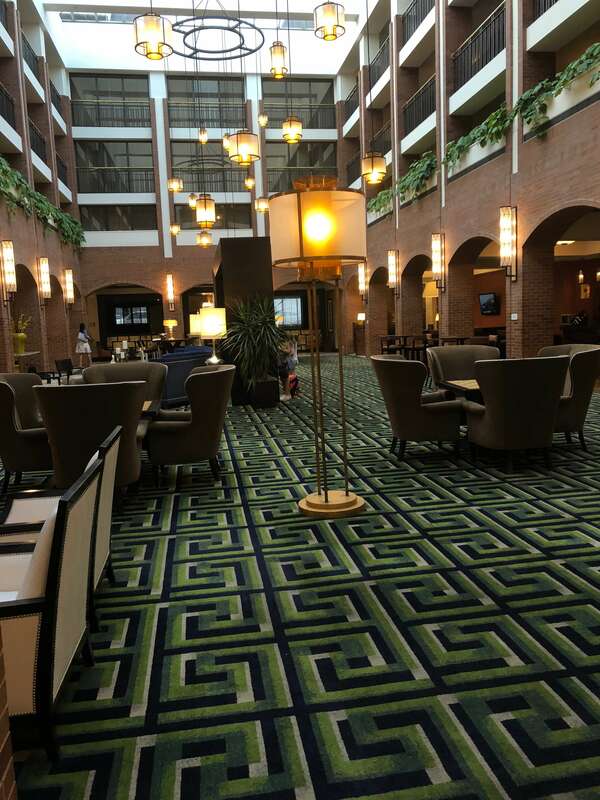 In between activities, we enjoyed some chill time at the Sheraton Philadelphia Society Hill Hotel. 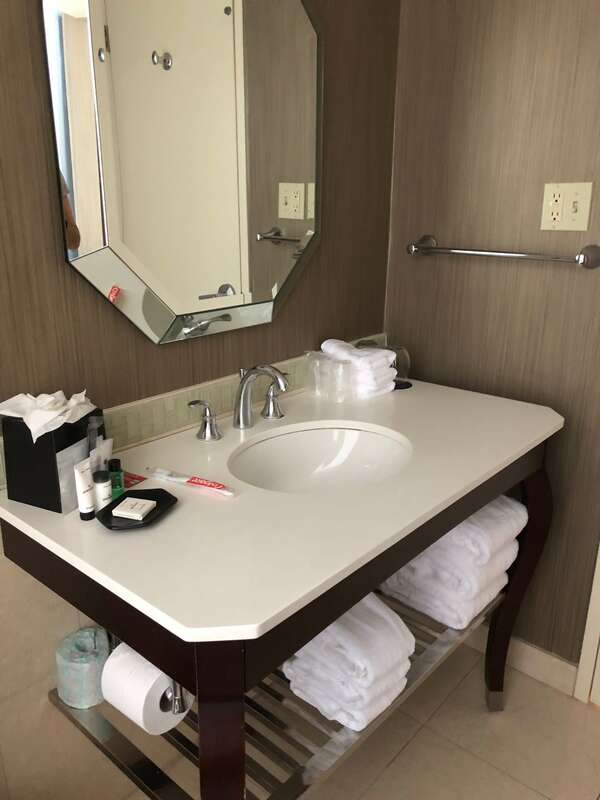 A prime location, the hotel was central to a lot of our activities and within walking distance to many restaurants that we enjoyed during our stay. 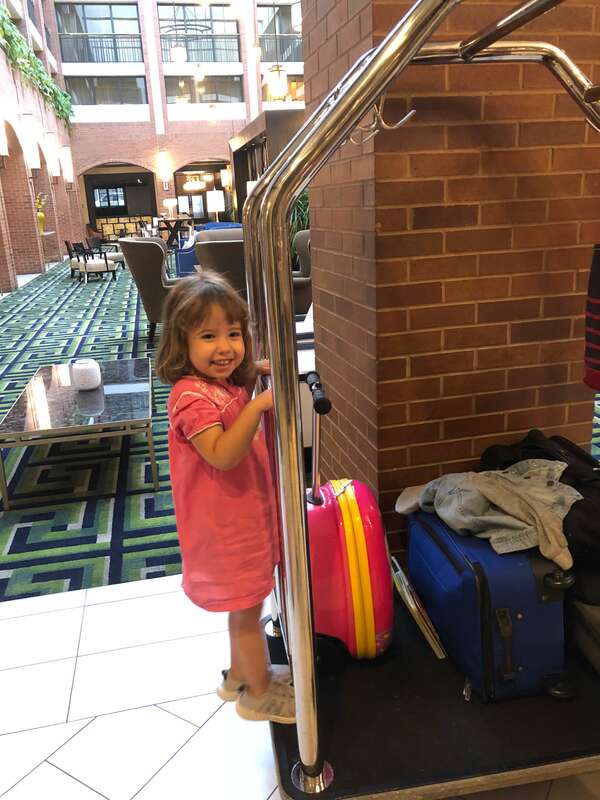 In addition to the comfy beds, the kids loved spending time at the on-site heated pool. I loved that they had a toddler/baby pool as well as an ample size area for my older girls. I also loved the fitness center that included a variety of cardio machines and weights. 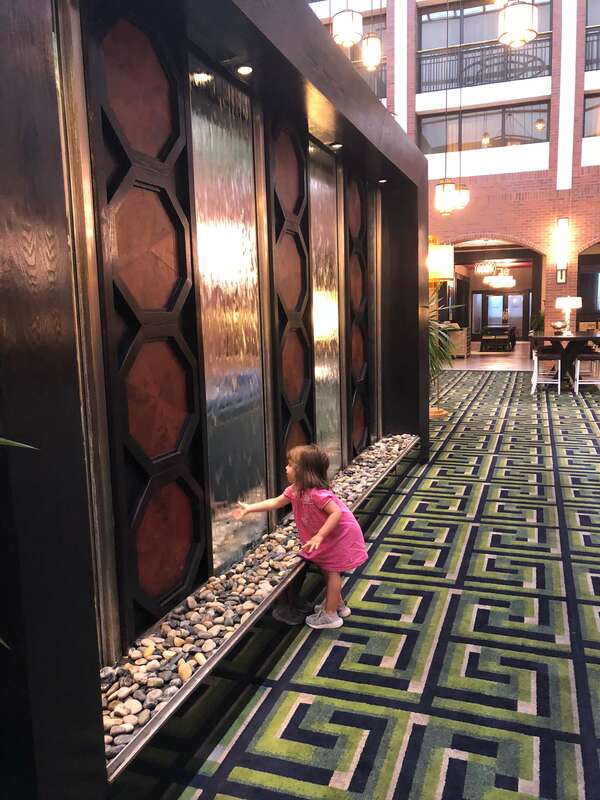 The modern lobby was also beautifully designed with a central waterfall display that the girls loved and on-site cafe where we enjoyed our morning coffees. 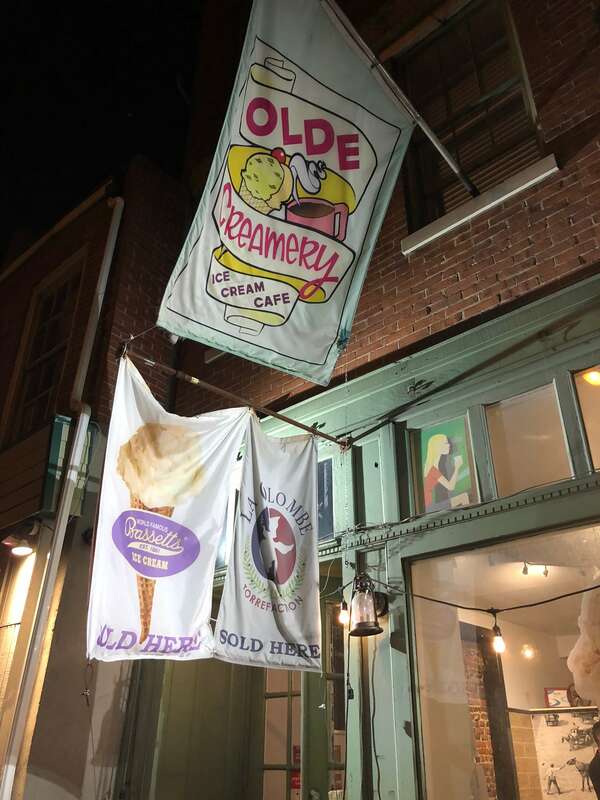 And if you happen to stay there, be sure to visit the Olde Creamery (down the block). The ice cream and milkshakes were so good and the staff was so nice and even gave my husband a free milkshake for Father’s Day. 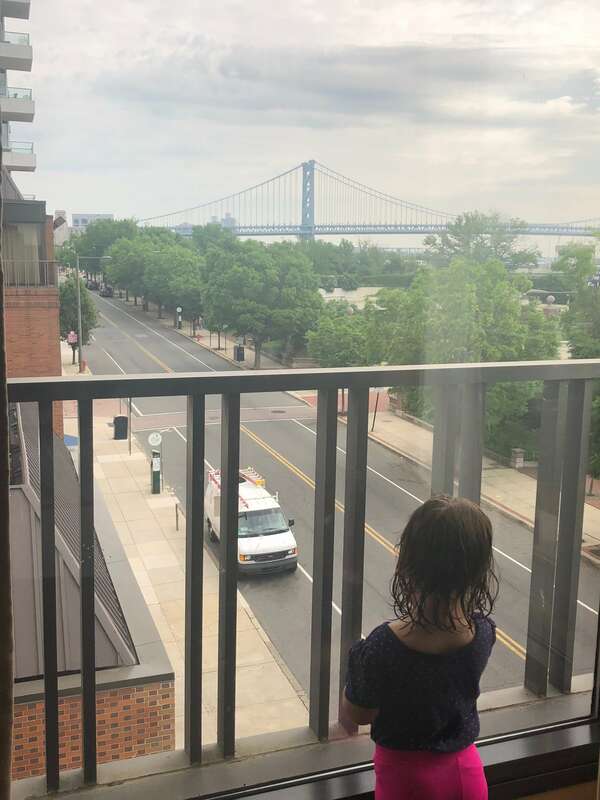 For most of our trip, we parked our car at the Sheraton Philadelphia Society Hill Hotel and used the Phlash bus system to get around. 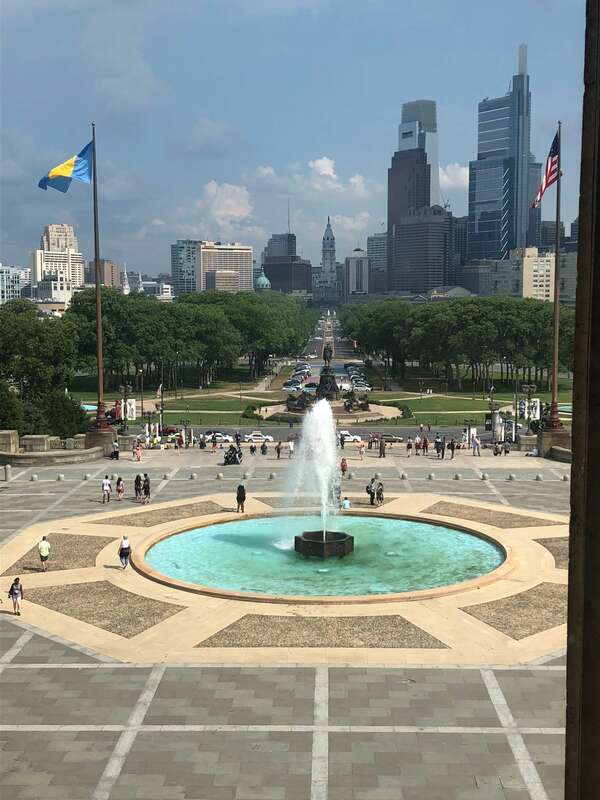 The Downtown Loop stops at 20 locations in Philly where you can hop on/hop off throughout the day. 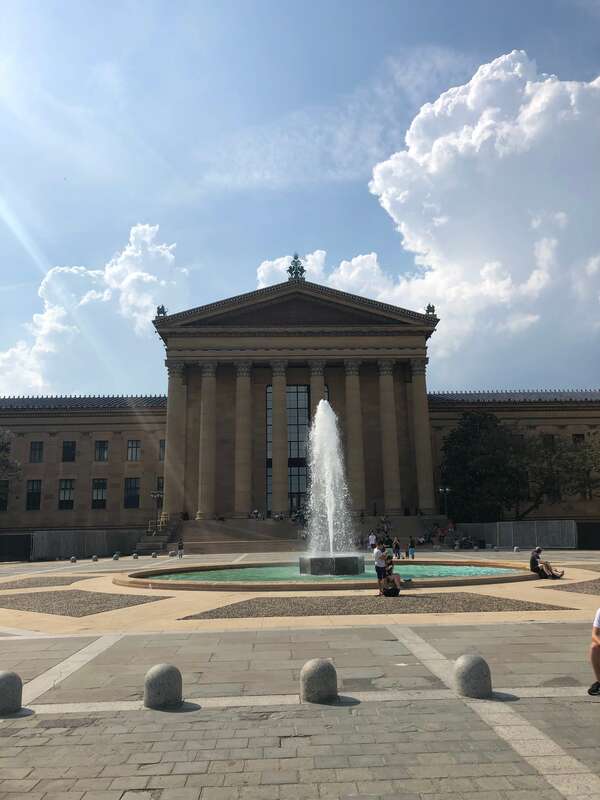 This was super convenient and easy to navigate where we hit up all of the major attractions (Eastern State Penitentiary, Philly Museum of Art, Reading Market, etc) without having to deal with our car or try to get a cab. Running from 10am-6pm, every 15 minutes, the bus stops were located very close to the attractions and clearly labeled with Phlash’s signature purple that always made them easy to locate. It was also really affordable where the Phlash pass was $5 for a day (covering all 20 spots), $2 per ride and kids and seniors are free! I was no paid for this post. 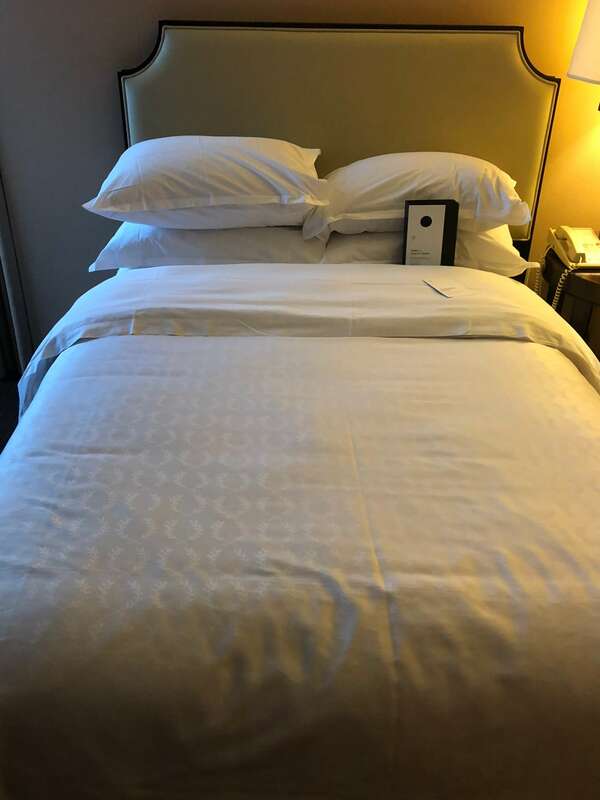 I was provided with hotel accommodations, activities and some meals for this review. All opinions, as always, are my own.